Last Saturday night at UFC 183, former UFC middleweight champion Anderson Silva returned to the Octagon for the first time in 399 days to tangle with former Strikeforce champion Nick Diaz, who was returning to action for the first time in 686 days. In honor of that main event, here are the top UFC wins following huge layoffs. It had been five years since the Octagon had graced the Emerald Isle, but it was coming back with a vengeance, featuring a litany of Ireland’s beloved sons, including its greatest MMA export: “The Notorious” Conor McGregor. 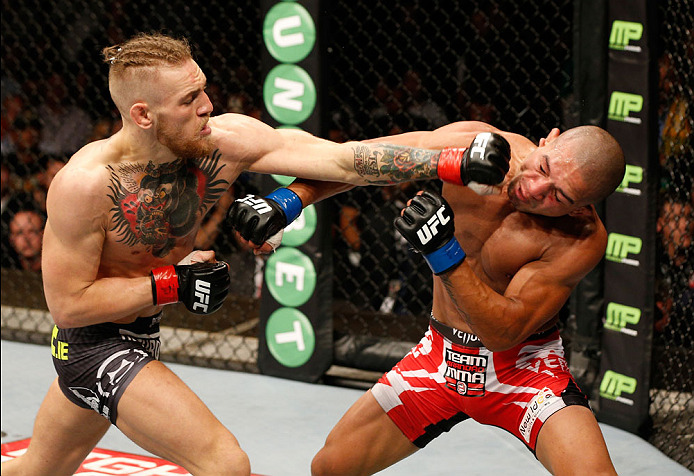 The previous year, McGregor debuted as a UFC featherweight with two big wins over Marcus Brimage and Max Holloway, but he then tore his ACL in the unanimous decision win over the Hawaiian. After a year of surgery, rehab and a non-stop press tour, making him the fastest rising star in his native country, McGregor headlined in his hometown of Dublin against The Ultimate Fighter 14 winner Diego Brandao. With a deafening crowd behind him, McGregor exchanged early and often on the feet with his Brazilian foe, which ended with the Dubliner earning a first round TKO and a Performance of the Night bonus. it could have gone for Lesnar, as he ate dozens of hard punches from Carwin, but Lesnar survived the onslaught. In the second round, the former NCAA Division I National Champion wrestler scored a much needed takedown and from there Lesnar secured an arm-triangle choke to earn his second successful title defense and a Submission of the Night bonus no one saw coming. Like a modern day Odysseus, current UFC middleweight champion Chris Weidman battled storms, injuries and monsters along his long journey to the top. In the undefeated New Yorker’s first main event, Weidman looked incredible against the always dangerous Mark Munoz. After a one-sided grappling-heavy first round, Weidman went to work on the feet against Munoz, which ended with Weidman slipping a punch to land a standing elbow that earned Weidman a Knockout of the Night as well as a shot at the division’s best: Anderson Silva. From there, the former two-time NCAA Division I All-American wrestler was hit with a shoulder injury and his house on Long Island was effectively destroyed by Hurricane Sandy. The following July, Weidman entered the Octagon at UFC 162 to take on the defending UFC middleweight champ, Anderson Silva. After a close first round in favor of the challenger, Weidman delivered a long loopy left, which caught Silva on the button and, sure enough, Weidman had cleared all the hurdles and was now the UFC middleweight champ. Didn’t he retire? Following his trilogy-ending title fight with UFC Hall of Famer Chuck Liddell at UFC 57, former UFC light heavyweight and heavyweight champ Randy “The Natural” Couture called it quits on an enviable career in mixed martial arts. Just shy of a year later, Couture announced that he would be making a surprising return to the Octagon at heavyweight – his first bout at that weight in five years - to take on the monstrous UFC champion Tim Sylvia. At 43 years old, The Natural would be challenging his largest opponent to date in the 6’8” Sylvia, who would have an enormous reach advantage and knockout power. None of that appeared to faze him, as within seconds of the battle for the belt starting, Couture landed an overhand right that floored Sylvia and The Natural proceeded to run the tables for the next 25 minutes toward a unanimous decision win and regaining the UFC heavyweight title. Current number one women’s bantamweight contender Cat Zingano succeeded against absolutely staggering physical and emotional odds. In her UFC debut, “Alpha” was thrust into title contention in a bout against former Strikeforce women’s bantamweight champion Miesha Tate with the winner getting the next shot at current UFC women’s bantamweight champion Ronda Rousey as well as a head coaching spot opposite “Rowdy” on The Ultimate Fighter 18. In a wild come-from-behind Fight of the Night battle for the ages, Zingano finished Tate with knees and elbows in the third round. 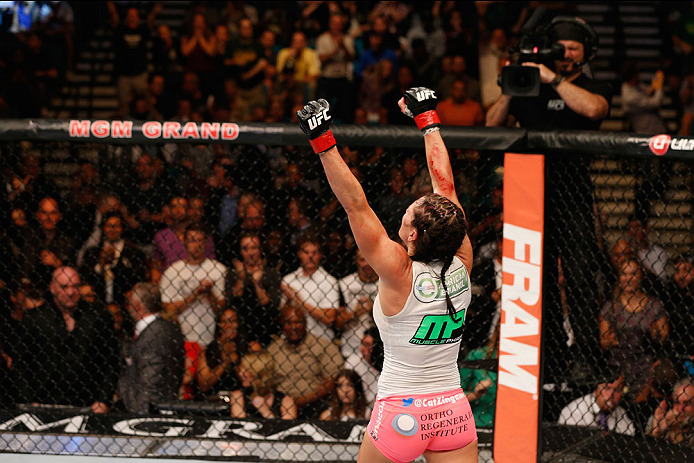 A month later in May, Zingano tore her ACL, requiring surgery and lengthy rehab. The following January, Zingano’s coach and husband Mauricio passed away. Yet the courage and strength was limitless within Zingano as she persevered through physical injury and unimaginable emotional heartbreak and made her UFC return in September 2014. Clashing with Amanda Nunes, who owned two first round KO wins inside the Octagon, Zingano fought tooth and nail with her opponent and earned a familiar ending by stopping Nunes with knees and elbows in the third round. Heading into his 41st professional fight, former PRIDE and interim UFC heavyweight champion Antonio Rodrigo Nogueira was set to compete in a pro MMA bout for the first time on his home nation’s soil. At UFC 134 in Rio de Janeiro, Brazil, the accomplished veteran was set to take on rising heavyweight knockout artist Brendan Schaub, following, by far, the longest layoff of Nogueira’s storied career. While Schaub was on a four-fight win streak that included three KOs, Nogueira was coming off his second career KO loss of his career, with the first striking stoppage occurring only two bouts earlier. With his back against the wall and, seemingly, his future with the UFC on the line, Nogueira summoned a remarkable stand-up performance by scoring a first round KO of Schaub, which earned him a Knockout of the Night bonus and an explosion of cheers and tears from the Brazilian crowd like no other. On October 18th, 2011, the MMA world shook as it learned that then-UFC welterweight champion Georges St-Pierre had sustained a knee injury which would require surgery. For the next year, “Rush” went through rehab and then back to training to rebuild himself as he left it - the greatest fighter the 170-pound division had ever known. In his return to the Octagon, St-Pierre would clash with the newly-crowned interim UFC welterweight champion Carlos Condit, who was enjoying a five fight win streak. In the end, St-Pierre reclaimed his spot on the top of the mountain using the trademark speed, timing and suppressing ground game fans had come to know from him, but it wasn’t without a harrowing moment. In the fourth round, St-Pierre took a kick to the face, which nearly finished him, but he battled through it and earned a unanimous decision and a Fight of the Night bonus. Once considered one of the premier UFC welterweights, Thiago “Pitbull” Alves disappeared from the Octagon for over two years. After a seven-fight win streak of dominance that led to his title shot at UFC 100, the Muay Thai wrecking machine traded wins and losses over the next couple years until his 2012 main event collision with Martin Kampmann in Australia. From there, Alves was booked for several bouts, which he was forced to withdraw from because of a variety of injuries. Finally, the American Top Team stalwart made his return to action in April 2014 at UFC on FOX: Werdum vs. Browne, where he took on the always game Seth Baczynski. The UFC faithful didn’t need to worry too much about how Alves would fight following the layoff, as Pitbull earned a unanimous decision win in the Fight of the Night. On top of that, Alves’ most recently earned a Performance of the Night bonus with his second round KO of Jordan Mein at UFC 183. 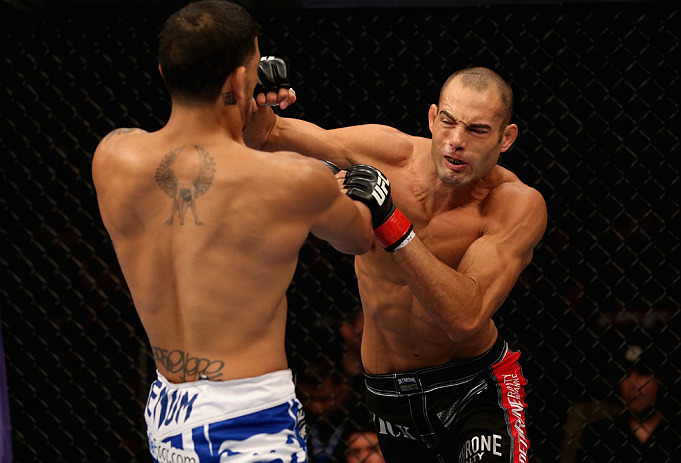 One of several standout stars from the original Ultimate Fighter cast, Mike “Quick” Swick had compiled an impressive 9-3 record inside the Octagon across two weight classes prior to his lengthy layoff. In a strange twist of bad fortune, Swick became ill in 2010 and misdiagnosed with having a stomach disease, which put him on an incredibly restrictive diet. While his stomach would continue to plague him through to the next year, Swick would go on to injure his back and later his knee, which sidelined the American Kickboxing Academy mainstay for the rest of 2011 and much of 2012. In his long-awaited return, Swick tangled with The Ultimate Fighter 9 finalist DaMarques Johnson. 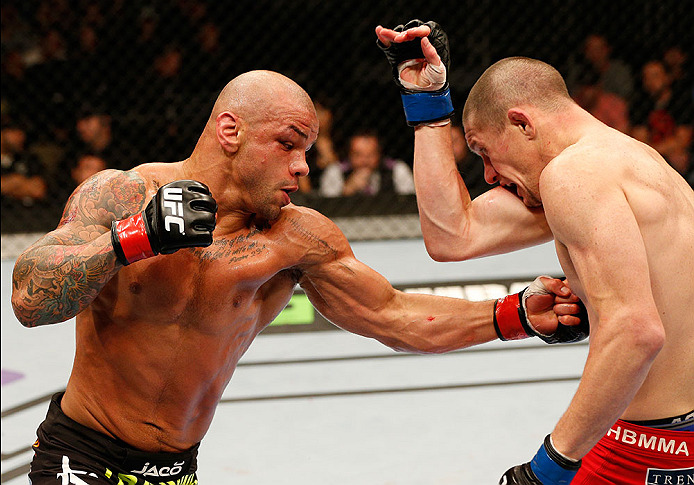 Always known as a fight finisher, Swick scored a second round Knockout of the Night of Johnson, which was his fifth striking stoppage inside the Octagon. Just a few days shy of being on the bench for three full years, the first UFC bantamweight champion, Dominick Cruz, made a seemingly miraculous return to the Octagon at UFC 178. It felt like a lifetime ago that “The Dominator” earned a unanimous decision win over Demetrious Johnson - prior to the flyweight division being created and Johnson winning that title - in October 2011. 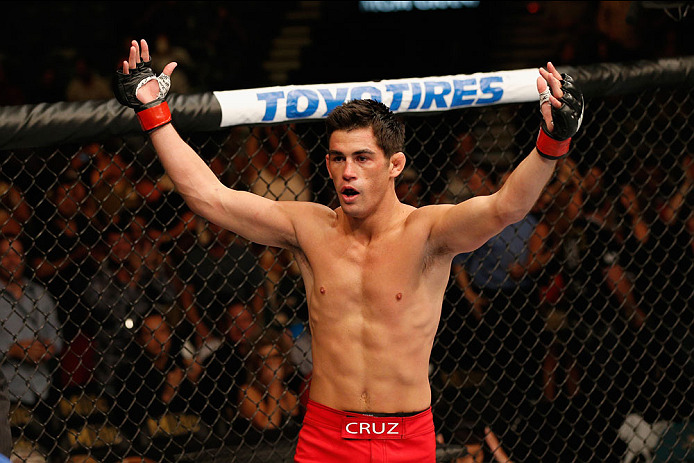 At that time, Cruz was on a 10-fight win streak, including two WEC bantamweight title defenses and two UFC bantamweight title defenses. Cruz was chosen to be a coach on The Ultimate Fighter 15 against his rival Urijah Faber, and the two were scheduled for a trilogy-ending bout at UFC 148. But disaster struck for The Dominator as he tore his ACL in training and seven months later found out his original surgery hadn’t worked and he would require another. The injuries kept coming as Cruz tore his groin in the lead-up to a title unification bout with then-interim champ Renan Barao in February 2014. As mentioned, almost exactly three years after his last UFC bout, Cruz returned to the Octagon with authority by scoring a 61-second knockout of Takeya Mizugaki and earning a Performance of the Night bonus. The Dominator was expected to take on current UFC bantamweight champion T.J. Dillashaw, but Cruz tore the ACL in his other knee and is on the mend again.